Dedicated to providing the best possible results using the latest equipment, techniques and products around. Premier Carpet cleaning are proud to of passed the stringent checks to be approved as a Which? Trusted Trader. Passionate about providing the highest quality professional carpet cleaning. Our service starts with a free quotation & honest advice. The price quoted is always the price that you pay. With many years of carpet cleaning in the Stevenage area, we tailor our service to each customers requirements. Depending on the job, we utilize a wide variety of carpet cleaning equipment and techniques including steam cleaning, hot water extraction, very low moisture cleaning, dry cleaning etc. The carpet cleaning products used in a domestic setting are specifically choosen to be gentle and 100% safe for children & pets. Depending on the environment, carpets are usually dry in under 2 hours. Google "Premier Carpet Cleaning" to browse our online reputation from trusted sources such as Which?, Checkatrade, Google and Facebook. Premier Carpet cleaning are proud to of passed the stringent checks to be approved as a Which? Trusted Trader. Only one in four businesses that apply actually pass the criteria to become endorsed. After being personally interviewed by Trading Standards, we passed a variety of tests including criminal, credit, insurance and checks on the validity of our professional qualifications. Professional Carpet cleaning for all domestic work - Houses, flats, bungalows, caravans. Office, shop, hotel, pubs, restaurants, churches, communitiy centre carpets professionally cleaned. Remove stubborn carpet stains effectively with our specialist skills and equipment. Protect your carpets from accidental spillage. Refresh rental property carpets between tennancies with our tailored services for landlords, estate & letting agents. Premier Carpet Cleaning techinicians strive to be polite, courteous, on time and provide fantastic cleaning results to your carpets. Fully trained by industry recognised bodies and fully insured to clean the carpets in your home. Your satisfaction is guaranteed, and if you are not entirely happy with the results then I will return to try and correct any problems. Many carpet cleaning competitors or "Splash & Dash" companies as I like to call them simply just rinse your carpets (the last step of our process below). Premier Carpet Cleaning takes from extensive training and experience to provide a carpet cleaning service which gets the best results every time. Forget your Dyson, Vax or Trusty old Henry. Vacuum cleaning a carpet with an upright Sebo vacuum cleaner is quite different. The carpet fibres are brushed and agitated with a fast spinning brush to free up any dirt before the high power vacuum removes it. It might be hard to beleieve but up to 70% of the soiling in your carpets can be removed by professional vacuum cleaning. Whilst preparing the carpet, the Premier Carpet Cleaning techinician will be surveying the carpet, looking for stains & identifying areas of high soiling. With the customers input, the technician will identify the cause of any stains and understand what sort of usage the carpet has had. Using this information the technician will plan how to pre-treat each area of your carpet to achieve the best results. Premier Carpet Cleaning carry a comprehensive collection of cleaning products & utilize a wide range of techniques to deal with each stain or smell. Individual spots are treated before a pleasent smelling pre-spray is applied to the whole carpet. Pre-spray breaks down grease and general grime, loosening it from the carpet fibres. Pre treatment products are worked into the carpet with a professional agitation machine called a Sebo Duo. This device powerfully agitates the carpet, working the pre treatment products into the carpets and further loosening any dirt grime and stains. Premier Carpet Cleaning utilize the very latest 600PSI Alltec Advance carpet cleaning machines (up to 6 times as powerful as some competitors machines) to powerfully rinse the carpet with a high quality cleaning product. The simultaneous high pressure water jet and powerful suction leaves the carpet clean, fresh and only slightly damp to the touch. My young dog had ruined my hall carpet. Jacob cleaned it and now it looks brand new and smells fab. Can't thank you enough would recommend this company to all. Reliable. Friendly and very reasonable prices. We have hired Premier Carpet Cleaning for a couple of years now. Last week we had a fantastic job from Jacob who left the house looking like a showroom! Fantastic , Thankyou! Premier Carpet Cleaning is your local choice for professional carpet & upholstery cleaning service in the Stevenage area. Fully trained, accredited & insured to clean your carpets with the promise to go the extra mile to ensure customer satisfaction. Where we cannot resolve any complaints using our own complaints procedure, as a Which? Trusted trader we use Dispute Resolution Ombudsman for dispute resolution. In the unlikely event of a complaint arising and you wish to refer the complaint to them please contact 0333 2413209 or via their website. © Premier Carpet Cleaning. All rights reserved. Premier Carpet Cleaning reserves the right to make changes to any part of these Terms and Conditions without notice. These terms are the most updated and supersede any other issued. By ordering Premier Carpet Cleaning's service by telephone, e-mail, fax or Premier Carpet Cleaning's website the client agrees to be bound by Premier Carpet Cleaning's terms and conditions. These terms & conditions are given to the client prior to any works and it is the responsibility of the client to contact Premier Carpet Cleaning should they have any issues in relation to these terms before work commences. Once work has commenced, it is accepted by the client that they have read & understood these terms & conditions in full, and that they have agreed to the quotation given and understand the outcome of the clean explained at such quotation, along with these terms & conditions. All fragile and breakable items must be secured or removed by the client before cleaning. Heavy items will not be moved if it is considered unsafe due to health & safety reasons. Any items that are specifically required to be moved that are deemed heavy, must be emptied first by the client before we arrive for the works to be carried out. If this has not been carried out we will clean around the furniture. If the client insists that we move furniture that has not been emptied (and if it is safe to do so) this will be done at the clients own risk. Furniture isn't designed to be moved whilst full (added weight) and damage can occur i.e. buckling, twisting, legs breaking etc. Therefore Premier Carpet Cleaning except no responsibility should damage occur in this instance. Further, Premier Carpet Cleaning reserves the right not to be responsible for:- cleaning job not complete due to the lack of hot water or power; third party (pets included) entering or present at the client's premises during the cleaning process, who causes re-soiling/damage; wear or discolouring of fabric/fibres becoming more visible once soil has been removed; failing to remove old/permanent stains that cannot be removed using standard carpet & upholstery cleaning processes, or odours re-activated from old spills/stains. Premier Carpet Cleaning will provide all cleaning material and equipment to perform the work specified by the client in professional manner using every care to accomplish a satisfactory level of service. The client agrees to supply all hot water and power for the works to be carried out, failure to supply this may result in a cancellation fee of £60.00 to cover loss of work, which will then have to be rescheduled at a later date. Furnishings are not usually manufactured with the intention that it will need to be cleaned later. This means that there are times when furnishings can be cleaned in accordance with generally accepted industry standards, with due diligence and care, yet the appearance of such furnishings can be negatively affected. Because of the variables involved with the blends of fibres, soiling and environmental conditions that may exist, Premier Carpet Cleaning cannot be held responsible for the following: Aging or deterioration, migrating marks from back of fabrics, unstable dyes, deteriorated foam cushions, restoring white fabrics, urine contamination, finish or glaze loss, frayed piping or welting, broken zips, breakdown of fabric backing, shrinkage, removal of stains, browning, fading, water marking, yellowing, pre-existing wear & tear, loose frames/legs, nicked wood trim, loose or missing buttons. up after soil is removed. Most fabrics have a care label attached to the frame under a seat cushion. These care instructions are for your guidance in the proper maintenance of the item. However, excessive soil or inadequate maintenance procedures may require a professional cleaning system other than that recommended, and will require your permission to do so. Any additional risks or limitations will be discussed for your approval prior to any work commencing and by agreeing to such work Premier Carpet Cleaning will not be responsible for any damage caused. All carpet edgings and seams should be correctly fitted in normal circumstances. It is the client's responsibility therefore to ensure this is the case prior to cleaning. If any edgings or seams are not secure Premier Carpet Cleaning will not accept any responsibility for any loose fibres/yarns subsequently becoming caught in any machinery and being pulled out due to this existing condition, or for any movement/parting of seems due to deterioration of carpet backing/glues/adhesive tapes. Can occur when fibres/fabrics made up mostly of natural fibres (except Belgian wiltons - constructed of synthetic fibres i.e. olefin with a natural backing) are exposed to moisture from accidents, maintenance spotting or non professional cleaning attempts. Premier Carpet Cleaning will undertake to avoid any such shrinkage problems by identifying susceptible fabrics/fibres. However, movement/shrinkage can also occur due to poorly fitted/repaired/replaced carpets/seams/edgings. Subsequently Premier Carpet Cleaning will not be responsible for any such movement or shrinkage, due to these existing problems. Deteriorated fabric or oxidized colours that are coated with heavy "waxy" soil may disguise certain conditions and not become apparent until after cleaning, i.e. colour loss, fabric splitting or fraying and loose worn fibres. Premier Carpet Cleaning will not be held responsible for these conditions should it become apparent. Unstable dye surfaces to leather can be caused by excessive wear. Greasy soils may slowly "coat" the surface of leather and at the same time disguise the erosion of the original lacquer on most leathers. Premier Carpet Cleaning will not be responsible for any colour erosion/flaking due to this existing problem, which may become evident after cleaning. Any protecting agents applied by Premier Carpet Cleaning are done so according to the manufacturer's instructions. They are not designed to give 100% protection but simply to assist in repelling moisture. The period of effectiveness of the product will vary according to the household conditions/usage. There is no guarantee that they will stop all liquids from penetrating the fibres, and this is explained at the quotation stage and subsequently applied with the consent of the client knowing this fact. All protectors will wear out and lose their effectiveness and this must be taken into consideration when requesting it. Premier Carpet Cleaning will not accept any responsibility for the product in what it can do and its limitations, and if there are any complaints/issues relating directly to the product then the client must contact the manufacturer directly in writing (details available on request). The Client may cancel/re-schedule a service by giving at least 24 hours notice. If Premier Carpet Cleaning are notified less than 24hrs, a fee of £60.00 is due immediately from the client to cover loss of work. Premier Carpet Cleaning reserves the right to charge a cancellation fee of up to 50% of the quoted price for the booked service. In the event that Premier Carpet Cleaning travels to the clients address on the designated day and the client or agreed acting person is not in, or Premier Carpet Cleaning cannot gain entry to the property by arrangements made by the client, the client shall be liable for the cancellation fee (£60.00). Payment is due immediately after works have been completed, either by cheque (made payable to Premier Carpet Cleaning) or cash. An invoice will either be submitted straight away or posted (where services are not completely decided upon by the client). For commercial clients a 30 day term is applicable. 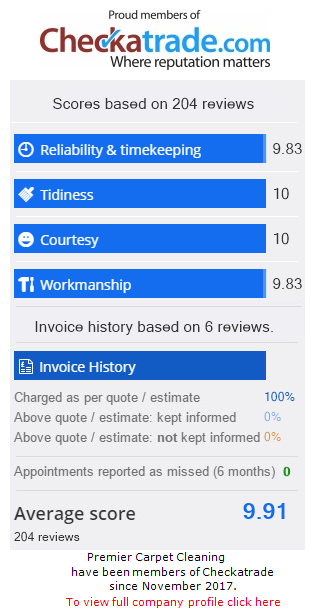 For either domestic or commercial clients, failure to pay on time will result in a late payment surcharge of 10% of original quotation price. Minimum charge for any service is £60.00. All costs incurred by the company in the pursuit of late payment will be added to the outstanding amount owed. In case of a complaint, Premier Carpet Cleaning requires to be notified within 24 hours after completion of the cleaning work. No claims will be acceptable after this time. If the Client is dissatisfied with the work, a cleaner must be allowed to return and re-do the job at no extra charge. The insurance policy will cover any accidental damages caused by an operative working on behalf of Premier Carpet Cleaning. The client accepts and understands that poor service, breakage/damage or theft must be reported within 24 hours from our service date. Failure to do so will entitle the client to no claim. Abbots Langley, Adeyfield, Albury, Albury End, Aldbury, Aldenham, Amwell, Ansells End, Anstey, Apsley, Ardeley, Ashridge, Ashwell, Aspenden, Aston End, Astrope, Ayot Green, Ayot St Lawrence, Ayot St Peter, Babbs Green, Bakers End, Baldock, Ballingdon Bottom, Barkway, Barley, Barleycroft End, Barkway, Batchworth, Batford, Bayford, Bayfordbury, Beane, Bedmond, Bell Bar, Belsize, Benington, Bennetts End, Berkhamsted, Hertingfordbury, Bishop's Stortford, Borehamwood, Bourne End, Bovingdon, Bower Heath, Boxmoor, Bozen Green, Bragbury End, Bramfield, Braughing, Braughing Friars, Brent Pelham, Brickendon, Bricket Wood, Bridens Camp, Great Gaddesden, Brookmans Park, Broxbourne, Buckland, Buntingford, Bury Green, Bushey, Bushey Heath, Bygrave, Caldecote, Carpenders Park, Chapmore End, Charlton, Chaulden, Cherry Green, Chipperfield, Chiswell Green, Cheshunt, Chipperfield, Chorleywood, Codicote, Cold Christmas, Cole Green, Coleman Green, Colliers End, Standon, Colney Heath, Colney Street, Cottered, Cow Roast, Cromer Hyde, Croxley Green, Cuffley, Clothall, Dane End, Datchworth, Digswell, Dudswell, Eastbury, Eastwick, Elstree, Essendon, Felden, Fields End, Flamstead, Flaunden, Frithsden, Furneaux Pelham, Gadebridge, Garston, Gilston, Goff's Oak, Gosmore, Graveley, Great Amwell, Great Gaddesden, Great Hormead, Great Munden, Great Offley, Great Wymondley, Gubblecote Green End: neighbourhoods or green space-buffered localities in Braughing, Hemel Hempstead, Little Munden, Sandon and Weston, Hadham Ford, Little Hadham, Harpenden, Hastoe, Hatfield, Hemel Hempstead, Heronsgate, Hertford, Hertford Heath, Hertingfordbury, Hexton, High Cross, Thundridge, High Wych, Highfield, Hinxworth, Hitchin, Hoddesdon, Holwell, How Wood, Hunsdon, Hunton Bridge, Hatfield Broad Oak, Ickleford, Jersey Farm, St Albans, Kelshall, Kensworth, Kelshall, Kimpton, King's Walden, Kings Langley, Kinsbourne Green, Knebworth, Labby Green and Letty Green, Hertingfordbury, Langley, Langleybury, Leavesden, Lemsford, Letchmore Heath, Letchworth Garden City, Lemsford, Leverstock Green, Lilley, Little Amwell, Little Berkhamsted, Little Gaddesden, Little Hadham, Little Hormead, Little Munden, Little Offley, Little Wymondley, London Colney, Long Marston, Loudwater, Maple Cross, Markyate, Marshalswick, Micklefield Green, Sarratt, Mill End, Sandon, Mill End, Rickmansworth, Moor Park, Much Hadham, Napsbury including Napsbury Park, Nash Mills, Nasty, Great Munden, Nettleden, Newgate Street, Newnham, New Mill, Tring, Northaw, Northchurch, North Mymms, Norton, Nuthampstead, Oaklands, Offley, Old Hall Green, Old Hatfield, Old Knebworth, Oxhey, Park Street, Piccotts End, Pimlico, Bedmond, Pirton, Potten End, Potters Bar, Preston, Puckeridge, Puttenham, Radlett, Radwell, Redbourn, Reed, Rickmansworth, Ridge, Ringshall, Roe Green, Royston, Rush Green, Rushden, Sacombe, Sacombe Green, St Albans, St Ippolyts, St Paul's Walden, St Stephen, Sandon, Sandridge, Sarratt, Sawbridgeworth, Shenley (including Shenleybury), Smallford, South Mimms, South Oxhey, Spellbrook, Staines Green, Hertingfordbury, Standon, Standon Green End, Stanstead Abbotts, Stanstead St Margarets, Stapleford, Stevenage, Stocking Pelham, Tewin, Therfield, Thorley, Thundridge, Tonwell, Tring, Tring Station, Trowley Bottom, Wadesmill, Walkern, Wallington, Walsworth, Waltham Cross, Ware, Wareside, Warner's End, Waterford, Water End, Dacorum, Water End, North Mymms, Waterend, Watford, Watton-at-Stone, Welham Green, Well End, Wellpond Green, Welwyn, Welwyn Garden City, Westmill, Weston, Westwick Row, West Hyde, Wheathampstead, Whempstead, Whitwell, Widford, Wigginton, Willian, Wilstone, Woodhall Farm, Woollensbrook, Woolmer Green, Wormley, Wyddial.